On 6 October, 1868 Constable McCabe was searching an area near the Queensland border for bushrangers Frank Pearson (Captain Starlight) and Charles Rutherford. He was accompanied by Constable Hugh McManus of the Queensland Police Force. During their patrol the police stopped for supplies at Shearer’s Inn, Enngonia (about 100 kilometres from Bourke). While they were so engaged, two riders appeared and entered the inn. Almost immediately, Pearson yelled “Bail up!” with the obvious intention of robbing those present. The two police, who had taken their weapons into the inn, turned and fired at the two offenders. Constable McCabe, who had dropped to one knee and fired, was shot in the chest, however he managed to fire several times, hitting Pearson in the wrist and right arm. The two bushrangers then ran from the inn and escaped. 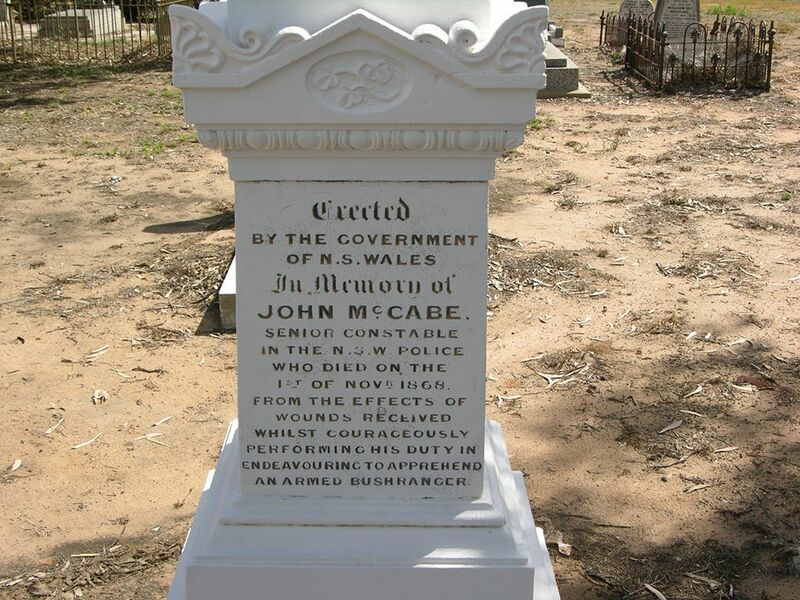 After rallying for almost a month, Constable McCabe died as a result of both his wound and the resultant infection. ( This murder is sometimes incorrectly attributed to small-time New England thug and armed robber Fred “Thunderbolt” Ward ). Despite the doctor’s confident prognosis, however, Senior Constable McCabe passed away a few weeks later. The senior constable was born in 1828 and joined the New South Wales Police Force on 23 February, 1863. 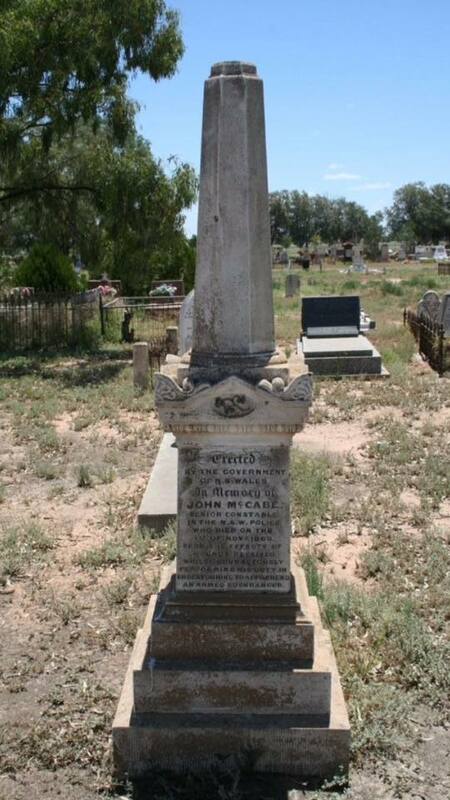 At the time of his death he was stationed at Biree (Brewarrina). Biree (a small outpost Station believed to exist only from 1865 to 1869 in the river country between Brewarrina and Enngonia). Old C of E, Bourke. Same GPS as ARMYTAGE as they are adjacent as can be seen in the long shot of the grave.